Liquid coating is almost always the most cost effective option. Because liquid coating does not use an oven, the cost of running the oven is not a factor in the pricing. Parts with heat sensitive material such as rubber cannot be put into an oven, or melting will occur. In these cases, liquid coating is the only option. Some of the bigger pieces that need coating will not fit in typical ovens. Even though Production Paint is installing a bigger oven to fit almost all of our larger orders, it may not fit every piece. Liquid coating has no sizing constraint. If your product will be enduring an abusive environment—such as an intense heat—again, liquid is your best bet. Powder coating is best intended for smaller parts. The smaller parts can be done quickly, and can be cured in the oven in high quantities. Once the product is out of the oven, it’s ready to use, so the waiting time is cut dramatically. 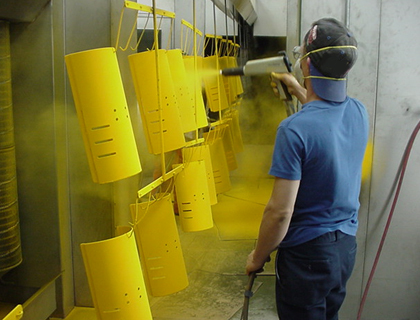 Powder coating only needs one coat of powder to be applied effectively. Also, powder coating is highly durable in comparison to regular paint. It strongly adheres to surfaces and is extremely flexible. Under certain circumstances, the powder coating can also turn out to be a more affordable option. Powder can be reclaimed and recycled, and that can save a lot of money in the long run. Because of this reclaiming ability and an extremely low level of harmful compounds, powder coating tends to be the better option for the environment, too. Certain standards and specifications actually require a powder coating. This would be why it tends to be the most popular choice all around. In the end, it comes down to the purpose of your product that you are looking to coat. That will point you in the direction you should be going with your coating needs. If you’re still looking for the best recommendations for liquid or powder coating visit Production Paint Finishers’ Contact Us page; if you’re ready to be quoted, click the following link to request a quote!